Benny is fourteen years old. As you can guess from the title, he loves watching videotapes. He is the kind of quiet kid of whom his friends’ parents would say, “Benny’s so polite, Benny’s so well-spoken.” He is also a glib sociopathic killer with no mercy or compassion for anyone, a state of mind that is exacerbated by his constant barrage of violent movies. When Benny does the unthinkable, his well-to-do intellectual wannabe parents (especially his dad) treat the crime as the equivalent of a C- in algebra. Mom and Dad are willing to protect their cretin son at all costs for the sake of their all-important reputation, but Benny ensures that he will have the last laugh in this chilling psychological horror film. “Benny’s Video” is typical Haneke; if you’ve seen any of Michael Haneke’s films, you know that means disturbing violence, static shots of absolutely nothing happening, and pointed social commentary about the effects of continual media consumption with no regard for reality. I did find this to be significantly better than “Funny Games,” it seems to me it was a little less obvious than that film, and has more of a black humor element as Benny’s parents act bewilderingly blase about Benny’s shattering act of violence. They’re rich entitled douchebags that would implode if they acknowledged Benny had a problem, let alone that he was a remorseless killer who attributed no value to human life. The actors do an amazing job, especially Angela Winkler as Benny’s conflicted mother. Arno Frisch ratchets up the dark and twisted as a good-looking and outwardly ordinary boy without a human bone in his body. The strangest character, though, proves to be the father played by Ulrich Muhe, who initially seems to be an ineffectual nerd but inside has the heart of a killer not unlike his son’s. 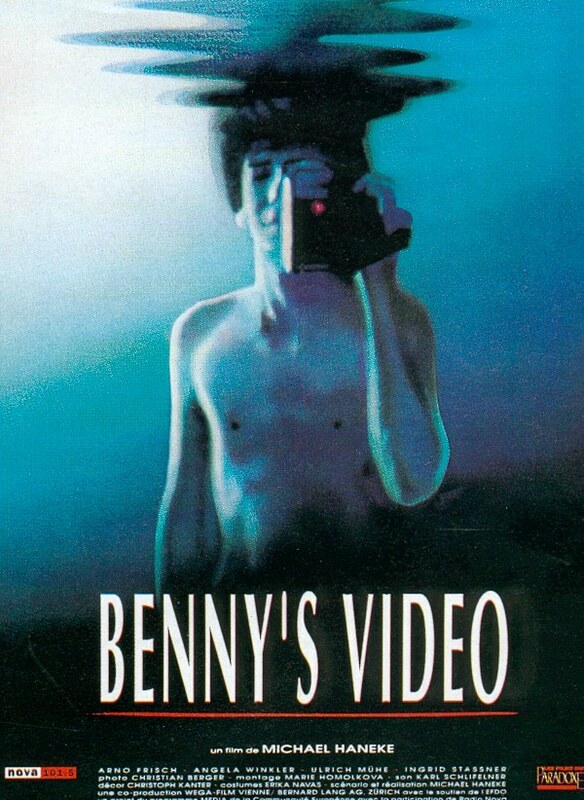 “Benny’s VIdeo” is chock-full of deeply unnerving imagery and sound effects- a woman’s hysterical sobbing as her son lies calmly on the bed next to her, stripped down to his underwear, the thrashing and screams of a pig being slaughtered in a tape watched again and again for the viewer’s enjoyment, and a young girl’s ear-piercing cries as she is shot repeatedly with a bolt gun. The images are provided not to titillate, but to depict what a existence without love and remorse might be like, and the consequences of such a half-life. We are also provided with commentary about media violence and how children without stability or natural empathy can be sucked in and seduced by gruesome celluloid images. Benny falls asleep to such stimulus every night, and although the bloody entertainment isn’t the only thing that’s driving him bonkers, it doesn’t seem to be doing him any favors. Haneke has an extremely unique way of shooting his scenes. Take the part where Benny murders a girl his age who was ill-advised enough to follow him into his apartment, for instance. Most of the scene is shown through a television within the film filming the act as the onlooker watches. You can see hardly anything, and the majority of the killing occurs teasingly outside the frame. But it’s ten times more disturbing than most Hollywood violent sequences that are exponentially more bloody. Listening to the girl shriek and kick her legs while Benny mumbles almost pleadingly, “Quiet. Quiet” is horrific, while Haneke proves you don’t have to show close-up shots and zoom in eagerly on the violence taking place to provide a truly unnerving scene. In the process, he shows that showing more of a sadistic murder taking place can actually have a desensitizing effect, rather than one evoking power or emotion. You have no characters breaking the fourth wall, no villains actually rewinding the scene to change the outcome- just a bleak, unsparing look at human evil and it’s consequences. Note the scene where Benny shows his victim the video of the pig being slaughtered. Rather than be disgusted or morally offended, she states flatly, “It’s snowing.” By painting a picture of disaffected youth at their most horrifying, Haneke also casts a lingering look into depravity and the contemptuous entitlement that exists within the upper middle class.